For some of our students, a career in nursing has been the aim from an early age. For others, like Helen Keeling, it is a vocation that presents itself a little later in life. What puzzled and frustrated Helen was the way in which some nurses provided her grandfather with high-quality care, while others seemed to simply perform their tasks without interacting with their patients at all. After her grandfather passed away, Helen began to take the steps she needed to become a nurse. Within four years of graduating, Helen had progressed to Sister of the unit, and was also managing a GP referral unit. The Advanced Nurse Practitioner course at LSBU ticked all of Helen’s boxes. “I was nervous about studying again to start with, but the academic team delivering the course were friendly, approachable and supportive,” she says. “I felt comfortable in class, with the confidence to ask questions. The staff were always available and that ongoing support was really useful if I had questions after the lectures." It genuinely made me feel as if they wanted me to succeed in my course, which gave me even further motivation. Helen really enjoyed her experience of studying at LSBU and looks back fondly on the mornings she would spend in the Perry Library, a facility she describes as ‘fabulous’. Helen is now an Advanced Nurse Practitioner for acute medicine/emergency care. It’s a role that requires Helen to draw heavily on her experiences during her course and she has found that it prepared her well. Helen still refers to the VITAMINS anagram she was taught on the course to ensure she thinks outside the box. Even today, Helen bears her grandfather’s care in mind when she is dealing with patients. 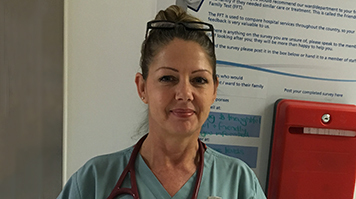 Helen also believes in giving back to the next generation of Advanced Nurse Practitioners and was honoured when LSBU invited her back to present her dissertation – looking at patients with acute alcohol withdrawal syndrome – to current students. “I wanted to share with them how important it is to be organised,” she says of the experience. I’m not a whizz-kid academic – I wasn’t an outstanding secondary school student, but I want everyone to understand that if you really want to learn and achieve something, it can be done. With the support of the academic team at LSBU I’ve achieved more than I ever dreamt was possible. Indeed, Helen’s skills and training have had a dramatic impact on a personal level as well as professionally.